You can be pretty sure that Saturday’s NY Times editorial condemning this year’s abbreviated charter revision timetable got the mayor’s attention. The editorial directly criticized Mayor Michael Bloomberg’s plan to rush charter revision in order to advance a couple of initiatives he’s especially interested in: term limits and non-partisan elections. At first glance, these seemingly simple changes to NYC’s political process look like things voters could handle without long analysis and discussion. But political changes, even the simplest ones, can have unintended consequences. 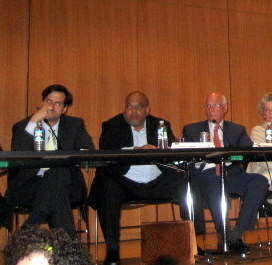 For example, restoration of City Council term limits to two 4-year terms could influence part-time Council members to devote more time to their private legal practices or businesses— or more insidiously — to temper their oversight responsibilities in anticipation of seeking post-Council employment at a government agency that was subject to that oversight. Equally dangerous: if the charter revision commission were to pair the popular term limits ballot initiative with unrelated and more obscure “technical” changes to the charter, such as “efficiency improvements” to the City’s land use rules — whose real effect would be to diminish a neighborhood’s chance to understand and respond to a proposed major development or zoning change. The Times is right — although not necessarily for all the right reasons. The charter revision timetable needs to be extended to 2012. There should be no proposals on the ballot this year. And, although neither Mayor Bloomberg nor commission chairman Matthew Goldstein probably cares a great deal what we think about this matter, they are likely to listen to the New York Times. This entry was posted in 2010 NYC Charter Revision and tagged 2010 charter revision, 2010 NY charter, bloomberg charter, charter revision, Matthew Goldstein, Mayor Bloomberg, media, Michael Bloomberg, Michael R. Bloomberg, New York City government, NY charter commission, NY charter revision, NY City Council, NYC charter, NYC City Council, NYC Government. Bookmark the permalink.